Question (Relevant to the Series 7, Series 24, Series 55, and Series 62): A market maker has a listed a quote of 32.20 – 32.80, 12 x 7 for ABCD stock on NASDAQ. The market maker accepts a buy limit order from a customer for 200 shares at 32.60. What quote will the market maker have to display to comply with a SEC rules? Rationale: The SEC requires market makers to immediately (within 30 seconds) display customer limit orders that are better than their current best quote for NMS stocks. In this case, the buy limit order is better than the market maker’s current bid (32.60 > 32.20) so the market maker must immediately display the adjusted quote. 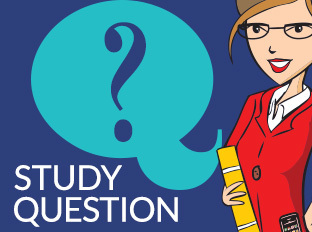 Congratulations to David A., this month’s Study Question of the Month winner! FINRA recently announced that it plans to file a proposed rule change with the SEC to replace the Equity Trader Limited Representative Exam (Series 55) with a new exam to be called the Securities Trader Qualification Exam (Series 57). FINRA will file this proposed rule change in conjunction with the national securities exchanges proposed rule changes to similarly replace the Proprietary Trader Qualification Exam (Series 56) with the Securities Trader Qualification Exam (Series 57). In preparation for the Series 57—a merger of the Series 55 and Series 56—FINRA will conduct a detailed job-analysis survey to gather information from individuals currently Series 55 and Series 56 registered regarding their present roles and responsibilities to ensure that the Series 57 exam accurately covers their day-to-day job functions. What is the maximum civil penalty that can be imposed on a firm when an employee engages in insider trading? Rationale: The maximum civil penalty that can be imposed on a firm when an employee engages in insider trading is the greater of $1,000,000, or three times the amount of the profit gained or loss avoided as a result of the violation. Rationale: Rule 10b-18 provides a safe harbor for issuer repurchase transactions. It allows the issuer to repurchase its own stock without being liable for manipulation based solely on the manner, timing, price, and volume of the repurchase transactions. In order to qualify, the transaction must be at a price equal to or less than the highest independent bid and the last independent transaction price, whichever is higher. The transaction must comply with broker usage restrictions, timing restrictions, and volume limitations as well. In order to qualify for the Rule 10b-18 safe harbor for repurchases, which of the following is correct? Rationale: Rule 10b-18 provides a safe harbor for issuer repurchase transactions. It allows the issuer to repurchase its own stock without being liable for manipulation based solely on the manner, timing, price, and volume of the repurchase transactions. In order to qualify, any repurchase transactions made in a single day must be made through only one broker-dealer. The transactions also must not be the opening transaction or within 30 minutes of the close of that market. For actively traded securities, the transactions must not be the opening purchase or within 10 minutes of the close of that market (actively traded securities are those with an ADTV of at least $1 million and a public float of at least $150 million). The transactions must comply with price and volume limitations as well. Series 55, 2nd Edition Study Guide – Now Available! Solomon Exam Prep is pleased to announce the publication of “The Solomon Exam Prep Guide: Series 55 FINRA Equity Trader Examination, 2nd Edition” (https://solomonexamprep.com/series55/exam-study-guide). FINRA has revised the Series 55 exam for Equity Traders into three new sections that reflect the three major functions performed by an Equity Trader. The functions include trading, order handling, and record keeping and regulatory reporting. The candidates will be tested on knowledge required to perform each of the job functions. The exam is still 100 questions long, and test-takers continue to have 3 hours to take the exam, but the passing score has been lowered to 67%. The weighting of questions has also changed, and will now focus more on trading and order handling rules and practices and less on general industry standard rules. Section 3: Record Keeping and Regulatory Reporting, 19 questions. The Solomon Exam Prep new Series 55 text is organized according to this new outline and reflects all new changes to the outline. Our online exam simulator has also been revised to reflect these exam changes. Customers can take quizzes by section, and also full exams that reflect the new question distribution, and the new passing rates. 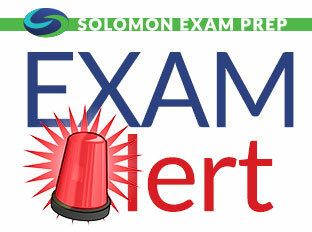 You can now order the new text as a digital or hard copy guide by calling 503.601.0212 or going to http://solomonexamprep.com. Author ProfessorPosted on November 14, 2013 Categories Exam Study Guide, Series 55Tags Equity Trader Exam, exam prep, Series 55, Study GuideLeave a comment on Series 55, 2nd Edition Study Guide – Now Available! Rationale: According to the Alternative Uptick Rule, if a stock declines by 10% or more from the previous day’s close, a short sale can only be made at a price above the best bid for the remainder of the trading day and the next trading day. The alternative uptick rule can only be triggered during regular market hours, but the pricing restriction holds during regular and extended trading hours. The rule only applies to NMS securities traded on or off an exchange. The Alternative Uptick Rule is also referred to as the Rule 201 Circuit Breaker. Orders marked short exempt are exempt from this rule.